An industrial revolution is sweeping over Heligoland, a tiny German North Sea archipelago once annexed by the British, and a haven for bird watchers until the wind farmers moved in two years ago. Units of Blackstone Group LP, EON SE and RWE AG have opened offices and warehouses at the main island’s southern port, taking 25-year leases as they start feeding electricity from three new farms into Germany’s growing reservoir of renewable energy. Singer, whose roots on the island go back to the 19th century, led a team that spent a year clearing the harbor of 1,300 bombs, grenades and bullets, remnants of two world wars. That has helped transform Heligoland, dependent on daytrippers seeking tax-free liquor and tobacco, into an offshore service hub for the wind turbines that now pepper the horizon. About 100 wind farmers have joined the 1,400 population, recognizable in their bright red overalls. Managers in business attire, once as rare as the black-browed albatross that sporadically visits its distinctive red cliffs, have also become a regular feature. EON is racing to complete construction of the 288-megawatt Amrumbank West wind farm 35 kilometers (22 miles) to the north before winter. Crews of 12 will then set out every morning to carry out maintenance and repairs on the 80 Siemens AG wind turbines rotating in the often inclement waters. Proximity to Heligoland saves EON’s staff the 44-mile daily shuttle from the coast and means they don’t have to sleep aboard hotel vessels common at other wind farms, says Sven Utermoehlen, the head of the company’s global offshore business. As Germany makes headway with its goal to generate as much as 45 percent of its power from renewables by 2025, EON and its competitors are installing a total of 208 turbines, each spending about 1 billion euros ($1.1 billion) on the endeavor. Some 170 wind mills are rotating, with undersea grid cables spanning a distance of about 90 kilometers that connect the generators to the mainland, producing enough power to serve 900,000 households for as long as 25 years. “Heligoland is a very convenient accommodation platform for us, little more than an hour away by ship from the wind farm,” said Hans Buenting, the head of RWE Innogy, whose 295-megawatt Nordsee Ost farm operates turbines supplied by Senvion SE. Exposed to battering waves and salt water, wind power plants typically need five days a year for maintenance, excluding unforeseen repair work. Singer estimates the boom will bring in more than 100 new jobs. While most of the recruits will come from the mainland as tasks at sea demand specially trained staff, some islanders are gaining employment. “Some are finding positions as captains or nautical officers, others can do refueling and mooring tasks,” he said. Still, emigration is a drain on the local economy. Young islanders leave to pursue education and apprenticeships further afield. Except for a short-lived boom after the fall of the Berlin Wall, when East Germans flocked to the islands, tourism has slumped. Last year, it counted just 316,000 guests, a far cry from 830,000 in its heyday in the 1970s. “We can’t compete against low-cost flights to Mallorca for 80 euros or 90 euros,” said Singer. Prices for a return ferry ticket from Hamburg to Heligoland range from 69 euros to 145 euros. His gold-rush spirit hasn’t yet spread to all the islanders. With a $233 million grant from U.S. Development Finance Institution, OPIC will support a 100-MW, grid-connected wind energy facility south of Nairobi. I have been out on the North Sea, and know the hazards and problems involved in offshore maintenance. There are very few independent maintenance companies in the European offshore industry. And the big customers for European offshore wind parks, are usually semi-state owned, state-owned and municipally owned utilities that are not necessarily dependent upon a double digit ROI. Another comment by the author I disagree with was that merely extending blade length increased turbine capacities. I have watched German large turbine capacities jump from 100 kw in 1982 with the German "Growian" grow to over 8 gw with the German Enercon, or 6 gw offshore with the Siemens SWT 6. Those increases were due to massive improvements in magnet technology- which boosted generator efficiencies, improvements n blade configuration, increases in tower height, reinforcing the increased height towers to accommodate the weight and forces on top of the tower, plus the increasing blade lengths and new blade configuration. Let us name names. Siemens and Vestas are the top 2 in offshore wind turbine - wind park construction. Their long term O.E.M. construction and maintenance contracts with the semi-state owned, state-owned, and municipally owned utilities have the advantage of low prices through volume, economies of scale, that smaller independent service and maintenance companies cannot achieve. The men and women who work for Vestas and Siemens Wind maintenance departments are top professionals with an eye to both quality work and safety, and are under no pressure "from executives" to deliver "double digit" profits. 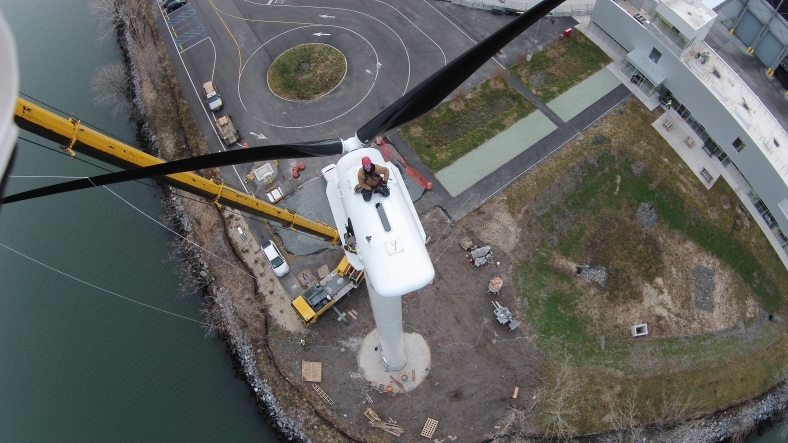 Smaller companies competing in the offshore wind maintenance sector do not have economies of scale, and would have to cut corners in safely and quality. Actually, for the semi-state owned and state owned utilities that are the ones that are the project owners of European offshore- the 15 year "photocopy " O.E.M. 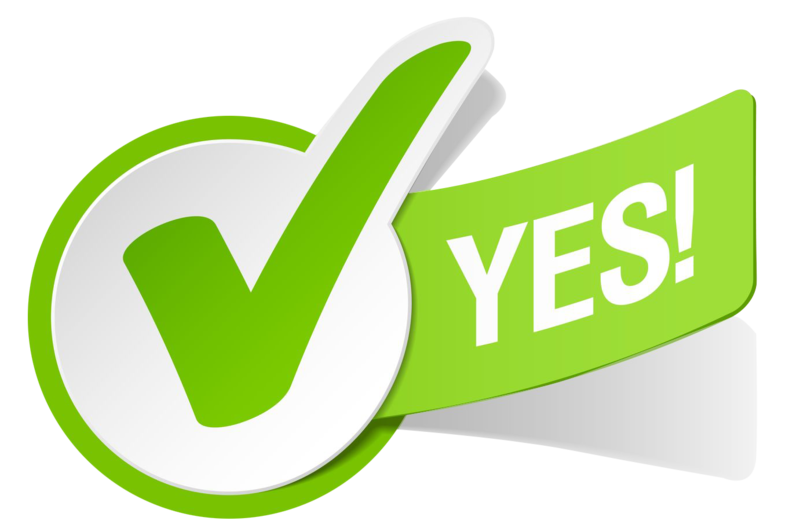 maintenance and service contracts are the most cost effective option. In 2014, U.S. turbines in distributed applications reached a cumulative installed capacity of more than 906 megawatts, enough to power more than 168,000 average American homes. | Photo courtesy of Aegis Renewable Energy; Waitsfield, Vermont . Washington, D.C. -- According to two reports released today by the Energy Department, the U.S. wind energy industry continued growing at an impressive rate in 2014, further solidifying America’s position as a global leader in wind energy. Wind power is a key component of the President’s all-of-the-above energy strategy and Clean Power Plan to reduce climate-changing carbon pollution, diversify our energy economy, and boost America’s economic competitiveness by bringing innovative technologies online. With rapidly increasing wind energy generation, fast-growing demand, and steadily decreasing wind energy prices—the lowest ever seen in the United States— the U.S. wind energy market remains strong. According to the 2014 Wind Technologies Market Report released today by the Energy Department and its Lawrence Berkeley National Laboratory, total installed wind power capacity in the United States grew at a rate of eight percent in 2014 and now stands at nearly 66 gigawatts (GW), which ranks second in the world and meets 4.9 percent of end-use electricity demand in an average year. The United States was the global leader in total wind energy production in 2014. The report also finds that wind energy prices are at an all-time low and are competitive with wholesale power prices and traditional power sources across many areas of the United States. A new trend identified by the report shows utility-scale turbines with larger rotors designed for lower wind speeds have been increasingly deployed across the country in 2014. The findings also suggest that the success of the U.S. wind industry has had a ripple effect on the American economy, supporting 73,000 jobs related to development, siting, manufacturing, transportation, and other industries—an increase of 22,500 jobs from 2013 to 2014. In total, U.S. turbines in distributed applications reached a cumulative installed capacity of more than 906 megawatts (MW)–enough to power more than 168,000 average American homes–according to the 2014 Distributed Wind Market Report, also released today by the Energy Department and its Pacific Northwest National Laboratory. This capacity comes from roughly 74,000 turbines installed across all 50 states, Puerto Rico, and the U.S. Virgin Islands. Compared with traditional, centralized power plants, distributed wind energy installations supply power directly to the local grid near homes, farms, businesses, and communities. Turbines used in these applications can range in size from a few hundred watts to multi-megawatts, and can help power remote, off-grid homes and farms, as well as local schools and manufacturing facilities. As shown in the report, America's distributed wind energy industry supports a growing domestic industrial base. U.S.-based small wind turbine manufacturers claimed another strong year of exports to countries across the globe, accounting for nearly 80 percent of U.S.-based manufacturers’ sales. For more information on these two new reports—including infographics and blogs—visit www.energy.gov/windreport. Join us this Tuesday, August 11 at 1:30 EDT for a webinar about key findings from the reports, and learn how wind turbines capture energy in this Energy 101 video. Agelbert NOTE: Since I know a thing or two about "how it works" in Puerto Rico, let me say that wind power was destroyed there when NASA put up a successful giant two bladed turbine on an outlying island municipality called Culebra (see quoted yours truly post from 2013 after this post). Some of you may have heard about the trade winds. Down in Puerto Rico they are known as the "Vientos Alicios" (Prevailing Easterlies). They are NOT intermittent. They NEVER stop. The Earth needs to stop rotating for them to stop. IOW its CFS for the ALL the Caribbean Islands to use WIND power 24/7 along with solar from the HUGE insolation factor they get on top of that. But it was not done BECAUSE of fossil fuel industry influence. It's almost forty years late, but finally, wind power and solar is taking hold in the Caribbean. Better late than never, I always say. For those who labor under the view that the reversal of fortunes for Renewable Energy in the early 1980s was just ignorance, supply and demand and big oil wasn't INSTRUMENTAL in bringing it about. Oh, and about NON-HYDRO renewable energy being THROTTLED shortly after the technology was proven competitive with fossil fuels. You mean you DIDN"T KNOW there was SIGNIFICANT PROMISING RENEWABLE ENERGY NON-HYDRO COST COMPETITIVE TECHNOLOGY BEFORE 1980? I understand that the media BURIED the FACT that IT HAPPENED TO WIND TURBINE TECHNOLOGY shortly after 1980 when Carter left office! It was SHELVED -DEEP SIXED - LEFT TO DIE UNTIL RESURRECTED in the mid to late 1990s BUT NOT BY THE USA! The GREATEST PENETRATION OF PURE HYDRO renewable energy in the USA was in 1940. Over 1500 hydroelectric facilities produce about one third of the United States' electrical energy. It was ALL DOWN HILL FOR HYDRO AS A PERCENTAGE of electrical energy generated FROM THEN ON. The NEW CSP, wind turbine and, to a lesser but still important extent PV technologies, were being assiduously developed during the late 1970s. Power companies closed ranks AGAINST that technology. Even places WITHOUT electricity like a Navajo Reservation in New Mexico triggered angry letters from the utility to NASA to STOP putting solar panels for water pumping there because it COULD "force electrical rates DOWN IN THE FUTURE". NASA STOPPED but Carter kept pushing until 1980. GET IT? Westinghouse uprated version, the Mod-0A. Four Mod-0A protototypes were installed (Puerto Rico, New Mexico, Hawaii & Rhode Island). When do you think the above pictures were taken, dear Diners? Would you believe THIRTY FIVE YEARS AGO!!? After the moon landings, the space program began winding down, and with it the space agency. NASA was scrambling to redefine itself, to find new "missions," when opportunity struck in the form of the oil embargo. What began as mere tinkering by researchers at the agency's Lewis research center near Sandusky, Ohio quickly evolved into the most costly wind energy R&D program in the world. NASA began translating all known documents on wind energy worldwide. They consulted with Hutter and Putnam and studied the operation of Juul's machine at Gedser. In the end they started down a path blazed years before by Putnam. The result, the Mod-0, resembled neither Hutter's lightweight, flexible, downwind design nor Juul's rigid thee bladed upwind design. NASA's Mod-0 incorproated none of the lessons of Europe, while abandoning Putnam's most significant design element, his hinged blades. Westinghouse, the contractor on the Mod-0, was subsequently hired to build an uprated version, the Mod-0A, for extended field tests. Four Mod-0A prototypes were installed (Puerto Rico, New Mexico, Hawaii & Rhode Island). All were sc****d when none of the host utilities wanted to assume maintenance of the turbines. The book goes on to explain, in detail, how various R&D goals of a high MTBF "couldn't seem to be achieved" in order for these machines to be considered "reliable". They could build rockets to the moon, supersonic aircraft, high speed jet turbines with micrometer tolerances but making gears, housings and transmissions for a glacially slow giant propeller to generate electricity was just "too hard". 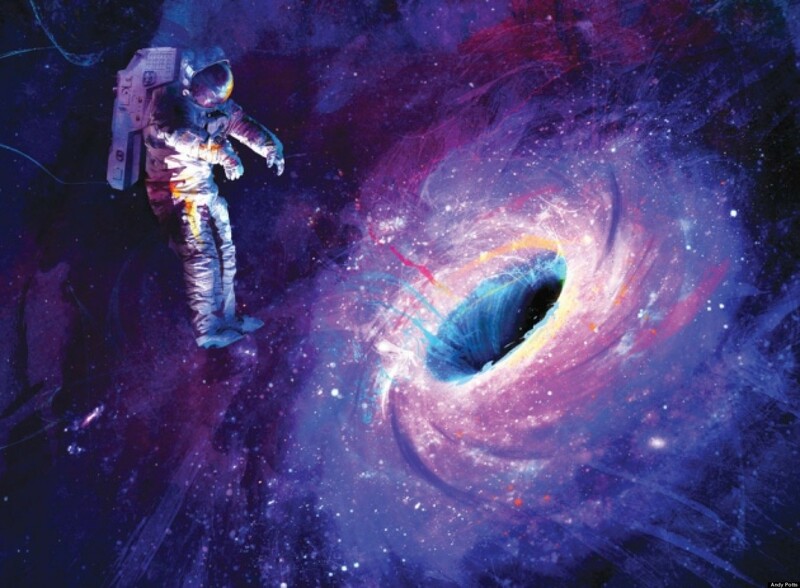 If you believe that, I have time shares in a black hole at the core of the milky way to sell you cheap. In June, wind power generated a third of Scotland’s electricity need, said WWF Scotland. The environmental group’s analysis based on data provided by WeatherEnergy found that for the month of June wind turbines in Scotland alone provided an 620,144MWh of electricity to the National Grid, while the total consumption was 1,891,536MWh. This represents an increase of 120% compared to that of June 2014, when wind energy provided 281,735MWh. WWF Scotland’s director Lang Banks said: “While much of the attention may have been focused on the welcome summer sunshine, June also turned out to be an astonishing month for wind power in Scotland. Thanks to a combination of increased capacity and stronger winds, output from turbines more than doubled compared to the same period last year – supplying power equivalent to the electrical needs of 1.7 million homes. While it seems offshore wind in the US is barely budging, there's a lot happening behind the scenes. Besides the tiny project under construction in the Northeast, offshore wind projects in the pipeline total 15.7 gigawatts (GW)! 13 that are in advanced planning stages total 6 GW - enough power for 1.8 million homes - and 12 projects (over 3 GW) plan to be operating by 2020. Offshore projects are moving ahead off the coasts of nine states. With 80% of US electricity demand coming from coastal states, offshore wind can play a crucial role in meeting our energy needs. Globally, there's now 9 GW of operating offshore wind farms, with another 4 GW coming online next year. In fact, offshore wind is expected to drive much of the industry's growth going forward. Turbines are getting bigger and bigger, with the largest ones at 6 MW and 8 MW (typical turbines on land are 1.9 MW). To give you an idea of how large they are, the average offshore turbine at 3.4 MW is 279-feet tall and the blades are 377-feet in diameter. Siemens, which leads on manufacturing offshore turbines, recently received a $1.2 billion order for 91 of its 6 MW turbines for Race Bank farm in the UK, and another order for 67 turbines for the Veja Mate Offshore Project in the German North Sea. The company is the favored supplier for a $2.9 billion order (171, 7 MW turbines) if the Hornsea Project One - the largest in the world - goes forward. Dong Energy is the developer for all these projects. Offshore wind is expected to reach 30 GW in Europe by 2020 - 45% compound annual growth, according to Bloomberg New Energy Finance. The has 8 GW installed right now. 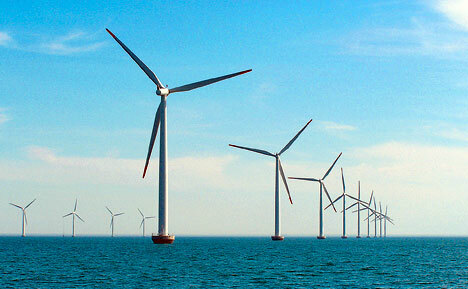 Read our article, Offshore Wind: Cheaper Than Gas By 2020. Check out this time lapse video. Watching the clouds go by is as much fun as watching the people! Early this morning, thousands of knee-high pinwheels creating the outline of a wind turbine popped up on the National Mall in front of the U.S. Capitol! The pinwheels were a celebration of an exciting announcement – that Procter & Ga mble has bought enough wind energy to make some of the best-known consumer products in America with 100% wind power. An EDF Renewable Energy wind project in Muenster, Texas will generate as much electricity as used by the company’s factories in Ohio, Missouri, Louisiana, Kansas, and Ontario to produce Tide, Downey, Dawn, Cascade, and Febreze. Those products sold nationwide will now carry the words “made with 100% wind power,” helping us get the word out that the clean energy revolution is here, and it’s being made in America. GRAFTON – A developer is proposing Vermont’s largest, most-powerful wind turbine site – 28 turbines churning out nearly 97 megawatts – on a ridge in the towns of Windham and Grafton, according to new plans released Monday. With that scale would come sizable economic benefits, as developer Iberdrola Renewables estimates $285,000 in annual tax revenue for Grafton and $715,000 for Windham – more than than that town’s entire budget. Also, the project might pump another $700,000 into the state education fund each year. Those numbers could change, as could the proposed project’s final layout: An Iberdrola administrator expects that residents in both towns might vote on a final proposal in late 2016. But after Copleman and other executives faced many questions at a packed meeting at Grafton Elementary on Monday night, it’s not clear how those votes will go. Administrators at Iberdrola and New Hampshire-based Meadowsend Timberlands Ltd. first disclosed in 2012 that they were interested in studying wind resources at Stiles Brook Forest, a 5,000-acre tract that lies mostly in Windham and Grafton. Meadowsend owns and works that land, and the company has put forth environmental and economic reasons for pursuing wind turbines. The project also has spurred consistent objections from Windham, where the town plan bans such turbines. Windham officials have traveled to Montpelier to testify about wind-siting and permitting issues. Though Windham officials opposed installation of meteorological-testing towers at Stiles Brook, the state Public Service Board OK’d them, and the towers began functioning in April 2013. In September, the Public Service Board granted Iberdrola’s request to continue using those towers for another two years. The company is far enough along, though, to show for the first time a preliminary, proposed layout for the Stiles Brook turbines. They would sprawl across the parcel, with some clustered around an existing power-line right of way and others standing farther out, near the borders of Meadowsend property. Stiles Brook’s turbines also would be, individually, the most-powerful in Vermont. Copleman said that’s a function of evolving design. “As turbines have gotten more efficient and cost-effective, they’ve been able to take advantage of more wind,” he said. In addition to unveiling their first official design on Monday, Iberdrola administrators also estimated that the company would pay a total of $1 million in annual property taxes to the two towns. This number, after it is set in the form of a final offer, would not fluctuate from year to year, Briot said. There were roughly 150 people at Monday’s meeting. And, while some residents asked about Iberdrola’s financial figures, others reiterated concerns about impacts on health, property values and aesthetics. Michael Clayton, a permitting manager for Iberdrola Renewables, displayed early tests showing that visibility of the Stiles Brook turbines would be “limited” in much of Grafton. Several of those in attendance questioned that conclusion, including Liisa Kissel, a Grafton Woodlands Group director. • When Kissel mentioned recent reports showing a lack of appetite among Vermont utilities for more wind-generated power, Copleman said the market could be different in 2019. “We think that, broadly, there’s an interest in renewable energy here in Vermont,” he said. Iberdrola planned to hold another community meeting on the Stiles Brook project Tuesday at Windham Meeting House. Beyond that, Briot pledged to continue to communicate with local residents. “As we have information and results from our studies, we will share them with you,” she said. Agelbert NOTE: Many NIMBY whiners weighed in. One of the best comments to address the lack of logic among the whiners is the following one. Unfortunately, the idiots claimed, incredibly, that there is "no evidence" that wind turbines help reduce climate change impact. HELLO? What part of burning LESS fossil fuels means LESS climate change damage do these biosphere math challenged morons not understand? At any rate, it's nice to know there are some Vermonters that get it. With all due respect to the commenters, I’m appalled by some of the gaps in rhetoric, employed by anti-winders, surrounding wind energy. Have we forgotten about climate change? This year it is projected that the world will lose another 15% of its coral reefs. Have already lost 30%. Meanwhile, entire mountain tops are being removed for coal mining. The United States is so far behind on climate change, as is the world. If Vermont can’t be seen to support renewables how do we have a chance at all? I want to pass this planet on to my children in a state that is not mired in the chaos caused by unabated climate change. Others don’t want to have to look at a wind turbine. I ask these people what will be more difficult. Looking at a wind turbine by now. Or looking into the eyes of the future generations and telling them that your obstructionism helped prevent Vermont from leaving the country against the impending global calamity that could reck most all ecology as we know it and irrevocably alter the way we live in Vermont and throughout the world . All energy comes from somewhere, it’s a sad state of affairs when people suddenly start caring about energy issues only when the effects of them appear in their backyard. Energy issues affect us all and wind is an effective renewable that can lead us away from a path of unknown chaos, death and destruction. Climate change is the biggest threat facing our planet today. We need to act before it’s too late and remember that our homes are but a small part in a global world under threat. Don’t forget climate change. It’s real and it needs to be addressed now. Mexico is planning to quadruple its wind power capacity as part of President Enrique Pena Nieto’s effort to transform the country’s energy industry. The country expects to have about 10 GW of turbines in operation within three years spread across almost every region, up from 2.5 GW in 2014, part of a government plan to add 20 GW of clean energy by 2030, according to Mexico’s Wind Energy Association. A total of 22 GW of wind power will be added over the next 25 years, requiring $46 billion in investment. The wind push is due to two converging trends: Mexico’s historic shift from a state-controlled energy monopoly, and its efforts to transform a grid that relies on fossil fuels for three-fourths of the nation’s electricity. "We’re already a new country," Alejandro Peraza, general director of the energy regulator CRE, said in an interview in Mexico City. "Mexico is getting cleaner." Mexico is Latin America’s largest crude producer and the world’s No. 10 producer of greenhouse-gas emissions. It was the first developing country to submit its plan to reduce carbon emissions before a United Nations conference in Paris in December, where almost 200 countries are expected to sign a deal to fight global warming. "There is a clear national policy on climate change taking place,” Peraza said. “We are going in the direction of a low carbon economy." "Investors are starting to line up their horses," Lilian Alves, a New Energy Finance analyst in Sao Paulo, said. To facilitate that transition, the government plans to hold annual energy auctions, with the first set for March. Power producers will receive certificates for every MWh of clean energy they generate, and will sell 20-year certificates through the auctions to large electricity users. Those who don’t meet the mandate may be fined as much as $200 per MWh used, according to Peraza. Large industrial users may be required to buy clean-power certificates on the spot market. Power companies are keen to jump into Mexico’s clean-energy market as soon as new rules for the auctions and certificates are finalized, according to Adrian Escofet, president of Mexico’s Wind Energy Association. Those policies are expected to be issued this month. Gauss Energia, a Mexico City-based company that owns Mexico’s largest solar farm, is planning to register 100 MW of power projects for the March auction. "I am optimistic," Chief Executive Officer Hector Olea said. "The certificates can’t be included in project finance papers now, as we don’t know their prices." "Developers are waiting for more benefits, such as possible tax cuts for renewable energy or different ceiling prices for each energy source," Arguedas said. "If the game rules don’t change a lot, I think the government’s target is going to be difficult to be reached." “This is an important moment to prompt wind-energy development,” in Mexico, said Angelica Ruiz Celis, Vestas Wind Systems A/S’s general manager for the country, where the biggest turbine supplier has 1 GW of capacity installed or under construction. "Mexico is a key market for Vestas." While gas prices are close to historic lows, he doesn’t see them remaining there forever, and Xcel expects prices for electricity from the fossil fuel to be closer to $32 a MWh over the same period. Fowke has plans to add 1,600 MW of wind energy over the next 15 years or so, partly to replace output from two coal-fired units that are being retired at Excel’s Becker, Minnesota, plant. He also expects to exceed requirements in its largest states, Minnesota and Colorado, to get 30 percent of Xcel’s power from renewable resources. “We have a plan to add significant amounts of wind to our system,” Fowke said, including about 800 MW by 2020. “We’re going to be able to retire coal plants earlier than we expected. It’s going to help us reduce our carbon footprint 60 percent by 2030” in the upper Midwest. Xcel fell 1.9 percent to $36.44 at the close in New York on Oct. 23. The shares have gained 11 percent in the past year. Mawson Station, located on an isolated outcrop of rock at the edge of the Antarctic plateau, is the oldest surviving, continuously operated research station south of the Antarctic Circle. It’s also the most remote of the three main Antarctic stations operated by the Australian Antarctic Division (AAD). Ongoing scientific research at the station includes middle and upper atmosphere physics, cosmic ray physics, geomagnetism, seismology, biology, meteorology, climate change studies, medicine, and automated upper atmospheric sciences. Two unique features make this station an ideal place to incorporate renewables for electricity generation. First, its remote location makes reliable delivery of diesel fuel difficult. Second, the wind resource in and around Mawson is outstanding. In 2002 and 2003, the AAD built two wind turbines at Mawson station, serving on average twenty researchers. Before installation began, the AAD completed an environmental impact assessment to ensure that the benefits of adding wind turbines outweighed potential negative ramifications including impacts on wildlife and the viewshed. 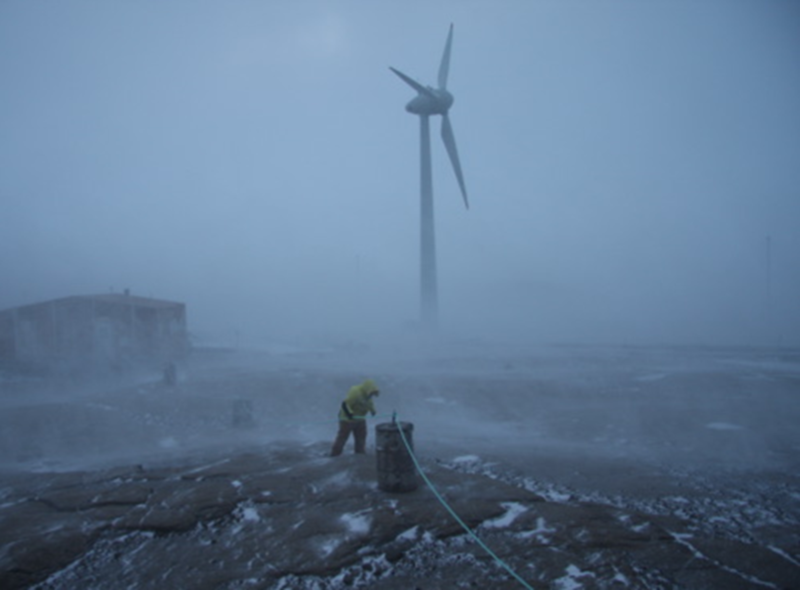 Mawson’s remote location and cold climate led to several challenges while preparing for and installing the two Enercon 300 kW wind turbines. The installation required a 100-ton crane, which called for the provision of a larger than typical icebreaking ship. Once the turbine components reached Antarctica, bridges at the station had to be strengthened to bear the weight of the vehicles transporting the turbines. Mawson station’s current electricity system includes 550 kW of diesel generator capacity, along with the 600 kW of total installed wind capacity. These resources are used to meet a load that peaks at 450 kW. Over the course of one year, approximately half of the electricity used at Mawson station comes from the wind turbines. The AAD website provides additional information about how this hybrid wind-diesel system is operated. Interestingly, Mawson station’s electrical loads go beyond thermal comfort, lighting, and plug-loads. The station also includes some luxuries for residents, such as a spa and a sauna, which require relatively large amounts of electricity compared to other day-to-day uses. In order to maximize fuel savings, the AAD worked to educate people about using these amenities only when wind energy is readily available, rather than at times of low wind when the diesel generators provide the majority of the electricity. The wind turbines created an additional impact on Mawson’s heating supply that’s of note for other remote microgrids with large heating requirements. Before adding wind to the system, two diesel generators powered the Mawson station and extra heat from these generators heated many of the station’s buildings. With the addition of wind, just one diesel generator runs for most of the year. This slashes the diesel requirement, but it also removes the extra heat source from the now rarely used second generator. In response, the AAD added an electric boiler to the system in tandem with the wind turbines. With any extra power available from the wind turbines, the electric boiler pre-heats water to heat buildings. The boiler is also connected to Mawson’s system with a smart inverter, which provides voltage and frequency support to the microgrid. The result is similar to having additional spinning reserves, since the boiler can ramp its output up or down quickly when there is a shift in available wind. In 2014 alone, the wind turbines generated enough electricity to reduce Mawson’s diesel consumption by 288,000 liters, directly saving the AAD $263,000 in fuel costs . The AAD also gained greater flexibility in scheduling resupply ships; instead of requiring a shipment of diesel fuel at least once per year to meet the station’s needs, the AAD can now send a refueling shipment every other year . The success seen at Mawson Station is already spreading, and other nations with operations in Antarctica have incorporated renewable resources for electricity generation. Furthermore, the now 10-year old wind turbines are still operating at high levels of efficiency—even in the tough winter climate. For more on the electricity system at Mawson Station, and nine other renewable microgrids from around the world, download Renewable Microgrids: Profiles from Islands and Remote Communities Across the Globe. Did you know that Texas, a state known for its lucrative oil and gas industry, is actually the largest wind power producer in the country? It now appears that wind farms are cranking out so much excess energy, that utilities are giving this renewable energy source to customers for free. The New York Times reports that thousands of customers in the state are paying zero for their electricity needs between 9 p.m. and 6 a.m., saving $40 or $50 a month during the peak summer season. The newspaper describes, for instance, that Dallas residents are waiting until after 9 p.m. to run the washing machine and dishwasher so it costs them nothing . One resident even unplugs her appliances when she goes to work in the morning then plugs them back in at 9 p.m.
Here’s a commercial from utility company boasting its free electricity at night. It might seem that this set-up is rife for wasting energy (such as cranking up the thermostat past 9 p.m.), but as the Times reports, the scheme actually saves the utility company money in the long term, since shifting use from peak hours means lower wholesale prices, and possibly avoiding the costs of building more power plants. “That is a proverbial win-win for the utility and the customer,” Omar Siddiqui, director of energy efficiency at the Electric Power Research Institute, told the publication. EcoWatch mentioned previously that the Lone Star state’s top power source is gas (50 percent) followed by coal (32 percent). However, in 2014, wind shot up to 10 percent of the electricity used in the grid, up from 6.2 percent in 2009. Wind powers approximately 3.3 million Texas homes. Texas also has the largest deregulated electricity market in the country, making it easier for energy companies to create new incentives and offer more economical choices for customers. WInd energy output is setting new records. And we thought October was impressive; turns out things have been even better this month. Grid operators in Texas (ERCOT) and the Midwest (MISO) continued jockeying for the wind output record in November, with ERCOT coming out in front this time. It hit a record high of 12,641 megawatts (MW) on November 16, which bested MISO’s 12,383 MW from October 28, for the highest output on a U.S. power system. Other grid operators hit high water-marks in recent weeks as well. PJM, which operates the power system for the Mid-Atlantic and Great Lakes states, reached a record output of 5,648 MW on November 1, while the Southwest Power Pool (SPP) cleared 9,000 MW on November 15. •Just this morning, MISO set a new hourly wind output record, reaching an hourly average of 12,295 MW, exceeding the previous mark of 12,194 MW set on October 28. While minute-by-minute wind output data from MISO is not yet available, it is possible that at some point this morning MISO wind energy output exceeded its previous instantaneous record of 12,383 MW. •For a combined nine hours on November 10 and 11, wind was the number one electricity generation source in SPP, averaging about 35 percent of the total energy mix. Impressively, the output averaged over this period neared SPP’s instantaneous output record of 36.8 percent, further proof that wind can contribute a significant amount to the electricity mix for a sustained period of time. •PJM, one of the largest power systems in the world, obtained more than 9 percent of its electricity from wind when it set its wind record on November 1. •The main Colorado power system has previously gone higher than 60 percent. The record outputs we’ve seen throughout the fall are the result of a broader “wind rush.” New wind project development, technological advances, and long-needed grid upgrades are making low-cost wind energy available to new customers across the country, resulting in a more reliable, affordable, and balanced energy mix. This is a trend we expect to continue in the coming years, and it will help businesses and consumers keep their lights on and extra money in their pockets. 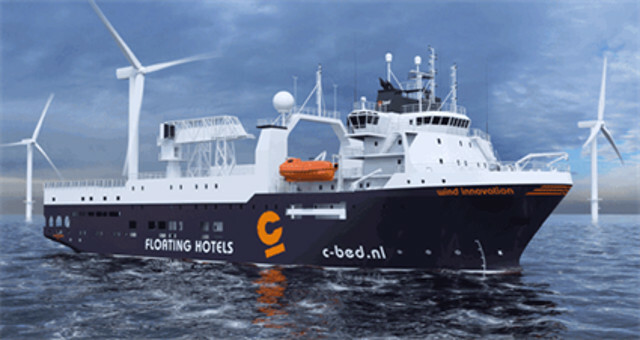 Dutch ship owner C-Bed has contracted Wärtsilä Ship Design to supply the design for rebuilding its Seismic Survey Vessel, the ‘Viking II’, for use as a hotel vessel. When completed, the rebuilt ship will be used to accommodate and transfer service personnel working on offshore wind farms. The rebuild project is being carried out at the Fayard AS shipyard in Denmark and is expected to be completed during the first quarter of 2016. The contract with Wärtsilä was signed in September. Wärtsilä provided the original designs for the ‘Viking II’ earlier known as ‘Veritas Viking II’, which was delivered in 1999 to the original owners, Eidesvik of Norway. After the conversion, the vessel will have accommodation and hotel facilities for 125 people and will feature a heave compensated gangway. The converted vessel will fulfil the requirements for Special Purpose Ships and will in the future be named ‘Wind Innovation’. “This is a fast delivery project and it was essential that our naval architects could respond to the owner’s needs quickly. This we are able to achieve and our design will result in a vessel capable of operating efficiently in challenging sea and weather conditions with a high level of passenger comfort,” says Ove H. Wilhelmsen, Managing Director of Wärtsilä Ship Design Norway.